Captain John took visitors out on his authentic Downeast lobster boat, the Lulu, from her dock in downtown Bar Harbor, Maine. 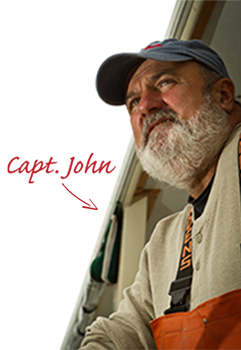 From 1998 to 2016, he introduced more than 120,000 visitors from around the world to the art of lobstering. Contact CAPTAIN JOHN to inquire about speaking engagements. Email info@lobstertalk.com or call 1-207-963-2341. 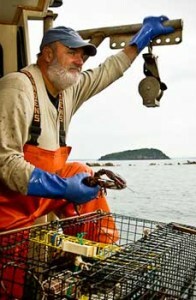 Lobster Talk is the most fun and interactive way to learn about lobsters and Maine’s lobster fishery! Led by professional speaker Captain John Nicolai, our presentations cater to everyone from elementary students to science and research-based organizations, and have been featured on The Morning Show, Food Network, PBS, and the Travel Channel, among others. Between his experience and enthusiasm, there’s no better way to get your fill of lobster than by enjoying one of Captain John’s presentations – except maybe by dunking one in butter! Copyright © 2018 John L. Nicolai, dba Lobster Talk. All rights reserved. Photos of Captain Nicolai courtesy of Lovin' the Light Photography by Linda Bainter.